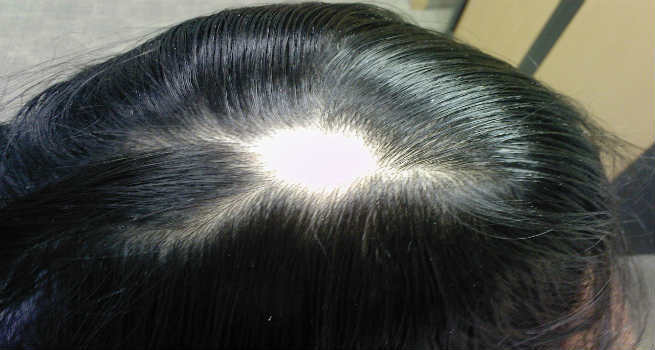 Alopecia Areata is a disorder where hair from the scalp or other parts of the body is lost in patches. It is not a permanent damage – the hair follicle is still alive but is dormant. It starts producing hair whenever it receives a signal to do so. Until then, people suffering from alopecia areata suffer from bald patches. There is a topical treatment called Minoxidil for Alopecia Areata. Before we get to the treatment, let us understand more about the causes and symptoms of Alopecia Areata. It can be caused when your immune system attacks the hair follicles and signals it to stop producing hair. While the reason for this is not known, it should however be noted that the effect is not permanent. Hair growth does resume after a period of time. Normally, people from the same family can be afflicted with Alopecia Areata, suggesting that it is a condition that is dormant in your genes. If you or your family members suffer from any auto immune disorders like diabetes, thyroid problems or lupus, then the chances that you will be affected by alopecia areata are higher. Your hair starts falling out in clumps and you may experience occurrence of bald patches the size of a quarter developing over a period of a few weeks. The patch may remain the same size or enlarge. The hair might take a few months or a whole year to grow back. Not just hair on the scalp, but you might see body hair also falling off. A small percentage of people might experience hair loss all over their scalp, known as alopecia totalis. It is diagnosed by the presence of smooth skin on the scalp without hair and the regions bordering it having broken off hair. A trichoscopy may be required to confirm the disorder. The trigger that causes the immune system to shut down the hair follicles from producing new hair is not known yet. Also, the condition itself is very unpredictable, since though you know the hair will grow, it is hard to say when the hair will grow back. So if the affected region is small and not very evident, it is suggested that you use a change in hairdo to cover up the bald spot, since anyway, the hair will grow back. However, if you are worried about further hair loss and conscious about the patch, then you can go in for a topical treatment of minoxidil. Minoxidil is a medication that helps in enlargement of hair follicles. It has been medically proven that minoxidil helps not only in controlling hair loss but it also promotes hair growth. By expanding the hair follicles, minoxidil allows it to receive more blood, oxygen and more nutrients. This extends the growth phase of the hair. Also, weaker hair that is nearing its life falls off and gives way to newer thicker hair growth. This helps in recovery from bald spots. Monoxidil is available over the counter and must be applied topically on the bald spot, twice a day. For best results, follow up its application with cortisone cream after half an hour. Continue applying until hair fall stops and your hair grows back. There are no documented side effects of minoxidil. It is safe to use and is an effective treatment for alopecia areata.